1. Optimize your levels of vitamin D as a great way to ward off osteoporosis naturally. Get a lot of sun exposure preferably in the morning hours to get a natural doze of vitamin D, or take a potent vitamin D supplement if you live in colder climate or are unable to spend a lot of time outdoors. 2. Maintain a reasonable ratio of Omega 6 to Omega 3 fatty acids. American diet is prevalent in Omega 6 rich vegetable oils found in processed foods like soybean, corn, canola oil and strongly deficient in high quality sources of Omega 3 cold water fish. 3. Vitamin K intake should be increased due to high risk of premenopausal osteoporosis in women in their 40s. Spinach, collard greens and other green leafy vegetables contain high levels of this important nutrient. 4. Incorporate in your diet more raw white onions containing high levels of gamma-glutamyl peptides that naturally tend to increase bone density. 5. 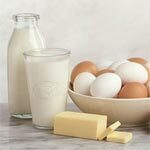 Amino acids found in high quality protein of organic eggs and exclusively grass-fed animals should become an integral part of the diet for preventing osteoporosis naturally. 6. If you are trying to prevent premenopausal osteoporosis, gluten is one ingredient you should consider avoiding as it may contribute to significant bone loss. Gluten is found in wheat, oats, barley and rye. 7. If you are concerned about your post menopausal osteoporosis, go easy on exclusive calcium supplements as too much calcium can give you gallbladder and kidney stones and might prevent the absorption of other vital elements necessary for strong bones. 8. Make a strong emphasis on fresh vegetables like tomatoes, cucumbers, garlic, parsley and green onions as these will strongly contribute to conserving your bone density much more effectively that calcium. 9. Strength training and resistant based exercises are vital parts of preventing osteoporosis naturally and building stronger muscles to protect your arms, legs and hips from losing their bone structure. Easy workout routines will help you out to develop an healthy exercising habit. 10. A surprising way to ward off osteoporosis naturally is consuming natural unpurified form of salt like Himalayan salt that is rich in vital trace elements found in the ancient oceans of the world that are free of the modern day pollutants.